(15 Jul 2017) This issue will make some rowing gear. And more rowing in the 1 August issue. 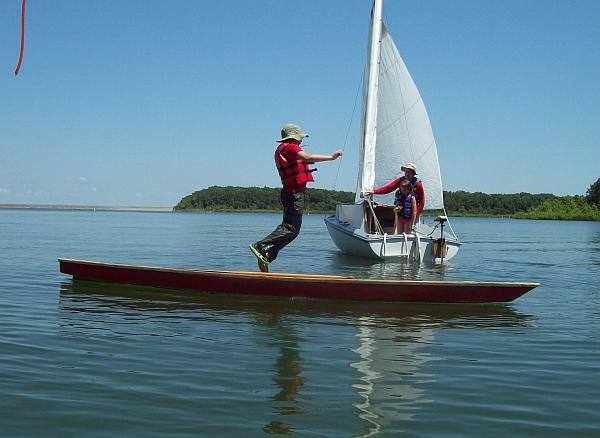 Sean takes a dip from his grand dad's (Gene Berry) new Paddle Plank at Gene's very recent Lake Stockton Messabout. The long narrow blades go against modern thinking of spoons, but for long distance rowing, long and narrow is the way to go. The average mortal can only pull so much of a load, in spite of what an Olympian might do. The Culler blades can match the mortal's pull. They might slip a bit when starting a heavy boat from a standstill, but once up to speed, they have full grip on the water. They balance better. They are less fatiguing. They have less windage. 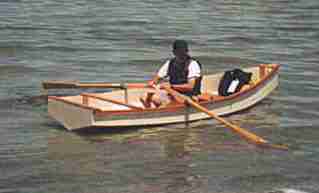 By the way, the oars of traditional Irish caurrahs have no blades on their oars. Neither do the paddles of some traditional kayaks. After the success Frank Kahr had with Robote I designed a smaller version with most of the same features. 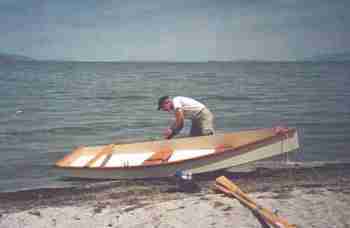 The idea was to get a fast and seaworthy boat that would cartop so easily that you would want to leave it on the car top more or less all the time, ready to go at a moment's notice. 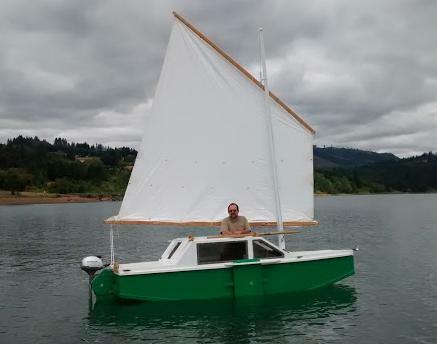 From cartopping smaller boats like Toto I had found that they hardly slow the car down or keep a compact car from getting 30+ miles per gallon on the highway. I thought the trick was to keep the boat small enough that complicated tie downs were not required. I also knew that Piccup, at about 90 pounds, is about the most a fellow would want to cartop. 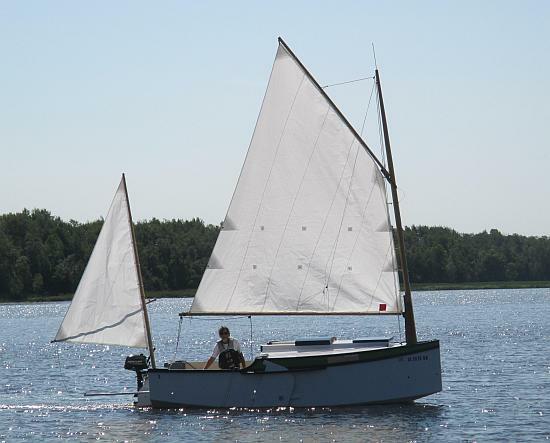 Lighter is better, of course, but once the weight gets below 70 pounds the boat becomes so easy to load that getting it super light is not mandatory. The prototype Vamp that you see here was built by Ken Prims of Layton, Utah. 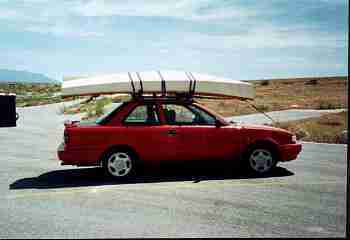 Here is his boat atop his compact car, a very nice package as I had hoped. Why not stick to a canoe like Toto? It has the size, weight and shape (mild sheer and squared stern) that makes for easy cartopping. 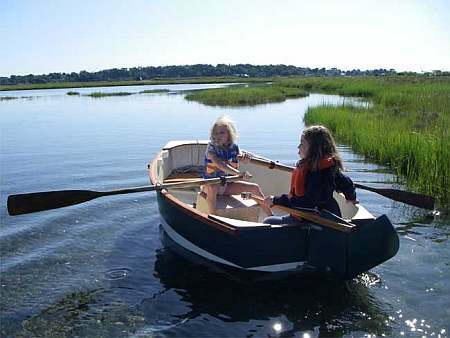 But a good rowing boat can be as fast, dryer, and take a passenger with more ease. The only problem I see with Vamp is that her V bottom can make beaching more challenging than a boat with a flat bottom plank. 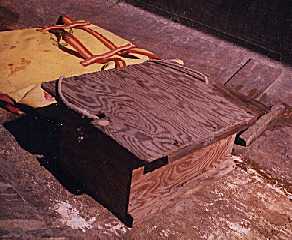 Construction is with taped seams from three sheets of 1/4" plywood, the same bill of materials as for the larger Robote. Robote will be a lot better if you are rowing with a passenger all the time. 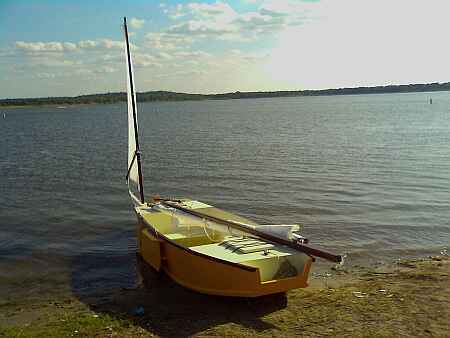 Vamp might be a handier impulse boat for a solo boater, although it can take two adults in a pinch.